This good way to eat chocolate comes with two provisos..First, the very best chocolate should be used. Lesser qualities may make for a slightly grainy panna cotta. Secondly, the recipe makes four servings. Since making panna cotta involves the use of gelatin and since gelatin is known for being temperamental, it t’were best (in making additional servings) to make the recipe twice rather than simply doubling it. Stirring together chocolate panna cotta is a nimble process. A second round of it will not be long in the making. 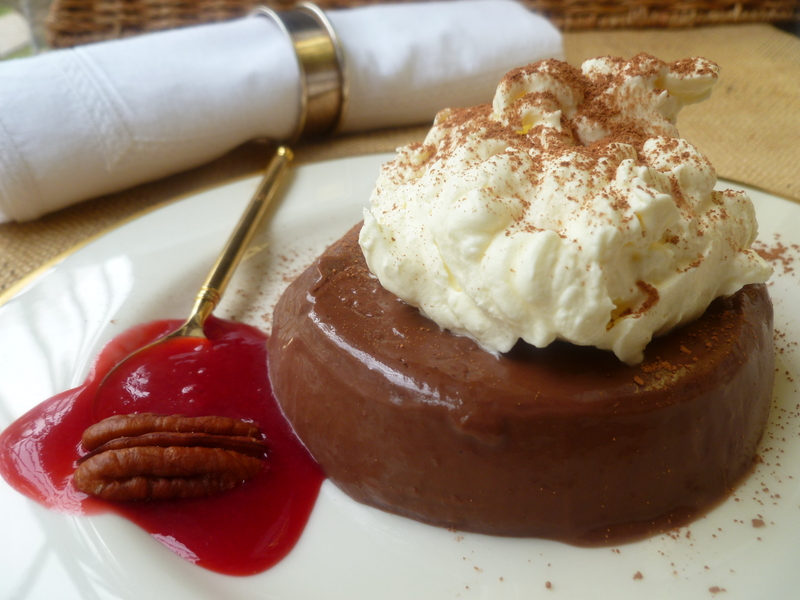 Postscript: The first time this chocolate panna cotta was brought to the diplomatickitchen’s dining table, it came decorated with a splash of raspberry coulis and a toasted pecan. A discriminating judge in all matters relating to chocolate tasted it and pronounced the raspberry and nut trimmings unnecessary. They were, he felt, ‘gilding the lilly.’ The coulis is pretty to look at, but, on reflection, I expect this chocolate lover’s pronouncement was right. But every cook will decide for him or herself. 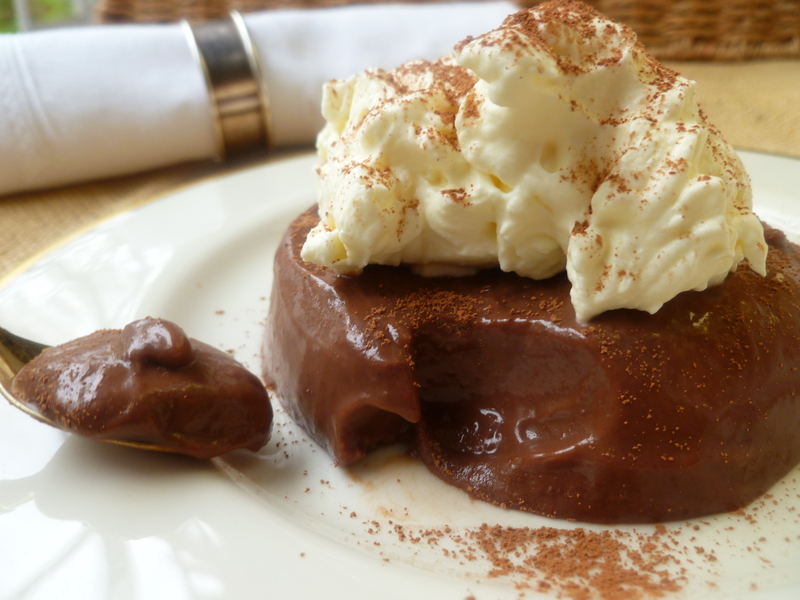 Timing Note: Chocolate panna cotta is best made a day in advance because the dessert requires cooling to room temperature and then, an at least an additional two hours of chilling in the refrigerator. Ingredient Note: The dessert is made with leaves of gelatin. An explanation of how to substitute powdered gelatin for the leaves is given at the end of the recipe. However, if you have a choice, gelatin leaves are the simpler option. 7 ounces Dark Chocolate of the best quality (200 g): What determines the quality?…the cocoa content. 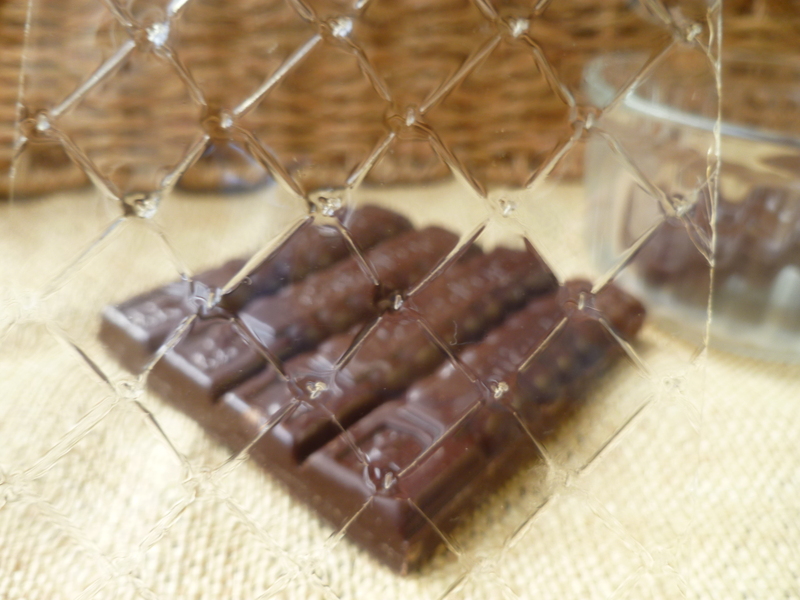 Look for a dark chocolate that is at least 70 per cent cocoa and a brand that you trust. 2 leaves of Gelatin: To substitute powdered gelatin, see the explanation at the end of the recipe. a Double Boiler or a homemade ‘Bain-Marie’: the Bain-Marie is made out of a pot partially filled with water and a heatproof bowl that will fit in the rim of the pot without touching its bottom. Ideally, the water in the pot should not touch the bottom of the bowl…but if it does…it will be alright. A photo of a homemade Bain-Marie is here in this previous diplomatickitchen post. a large Strainer…if you haven’t got one, simply remove the used vanilla bean from the liquid in Step 3 below and pour the liquid directly into the bowl. 1. Lightly oil the ramekins with some vegetable oil. (A suggested method is to dip a corner of a paper towel in oil and rub it around inside each ramekin.) The oil should coat the inside of the ramekin but leave no puddle in the bottom or around the edges. 2. 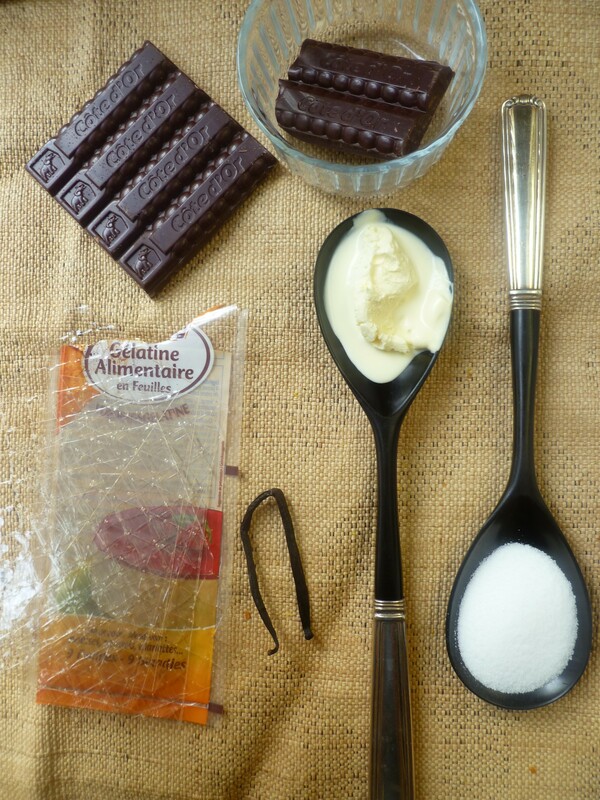 Place the chocolate in the top of the double boiler or in the bowl of the Bain-Marie and melt it slowly, without stirring. Remove the chocolate from the heat and set it aside to cool a little. 3. Soak the gelatine leaves in 2 cups of cold water for 10 minutes. While they soak, place the milk, cream sugar and split vanilla pod in the pot and bring the liquid to a simmer. 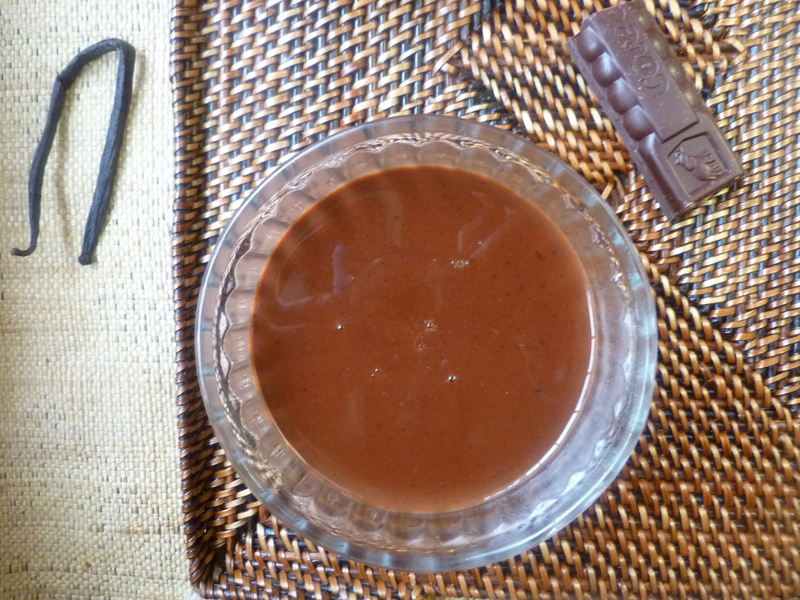 Remove it from the heat and strain it over the melted chocolate, stirring well to combine liquid and chocolate together. 4. Remove the softened gelatine leaves from the water and gently squeeze them to remove excess liquid. Add them to the warm chocolate mixture and stir until the gelatine is dissolved. 5. Divide the chocolate mixture among the ramekins. Cool the desserts completely to room temperature. Cover and refrigerate them overnight. 6. To unmould the desserts: Place a pan of hot water, a thick dish towel and the dessert plates out on your work area. Dip a ramekin about half-way up the side into the hot water and count to 10. Remove the ramekin from the water, place a dessert plate over the top of the ramekin. Holding both the ramekin and dessert plate together with both hands (thumbs under plate and fingers on top of ramekin), flip plate and ramekin–plate down and ramekin topside, and bang firmly down on the towel. If you don’t see the dessert begin to release from the bottom of the ramekin, bang it again…The dessert will begin to release from the bottom…bang once more if necessary and give the dessert time to finishing slipping out onto the plate before lifting off the ramekin. Another alternative is to run a knife around the inside of the ramekin to detach it a little before flipping it upside down on the dessert plate but it is preferable not to let the dessert slip out of its own accord…the sides of it will be prettier. 7. 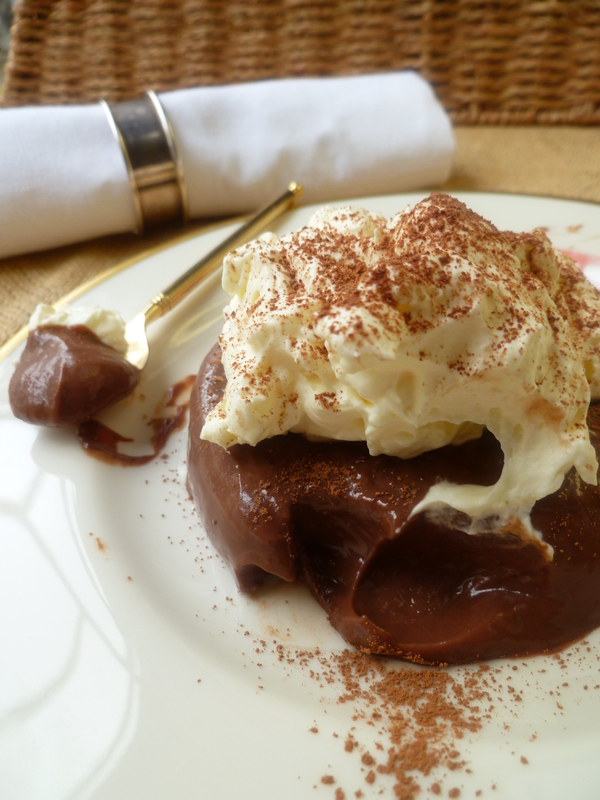 Decorate each dessert with a spoonful of whipped cream and sift a little cocoa powder over the cream and down onto the plate. Raspberry coulis and a toasted pecan at the side are another option. 1. Use 2 teaspoons of powdered gelatin. The method differs only in Step 3 above. Sprinkle the gelatin over the surface of the cold milk. Do not dump it in a pile into the milk or the granules in the middle won’t dissolve properly. Let the gelatin and milk stand for 10 minutes. 2. Heat the milk and gelatin gently, stirring, until the gelatin dissolves, and set it aside. 3. Heat the cream, sugar and vanilla and bring them to a simmer. Remove them from the heat and strain them into the chocolate mixture. Stir to combine well. Then add the gelatin mixture and stir to mix it in completely. Pour into moulds. 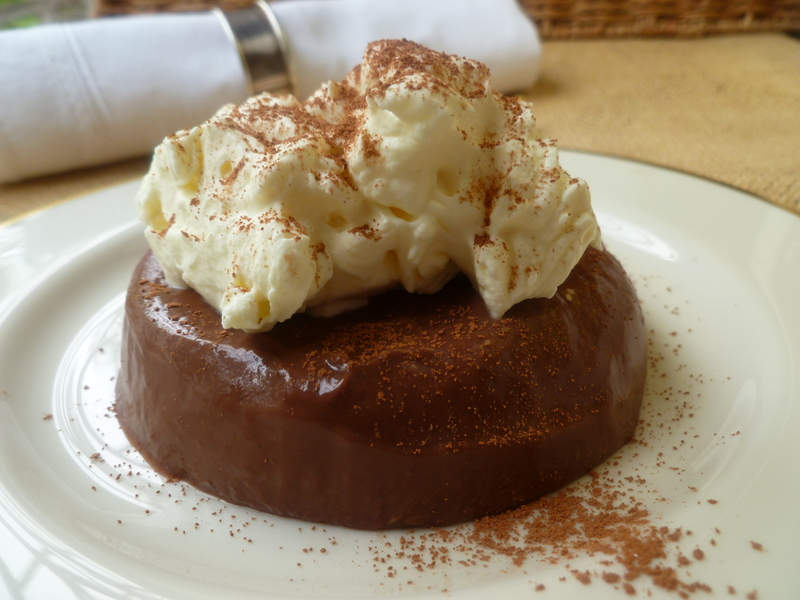 A Note: The dessert for the Dinner Menu: Surf and Turf Chez Leauchli is Chocolate panna cotta. The recipe is adapted from one that appeared here in The Independent, a UK newspaper (July 10, 2011). Very kind and thank you.